Caladiums are tropical plants that are grown for their brightly colored foliage. Caladiums are commonly grown in containers or outdoors as bedding plants and mass plantings in shady spots. Typically growing 1 to 3 feet tall, caladiums have mixtures of white, green, pink and red leaves, with contrasting leaf veins and edges. The foliage colors vary among the different species and cultivated varieties. Caladiums are frost-tender plants, so they require special care in order to survive the winter months in regions where temperatures drop down to or below freezing. Dig up the caladium tubers in fall, before the leaves have lost all their color and before the first frost. Spread out the caladium tubers onto a tray or paper towels, and allow them to air-dry for one week. Keep air temperatures warm and no colder than 40 degrees F.
Cut the dried foliage from the caladium tubers. Brush off the dried soil gently from the tubers, and clean them with a dry cloth. Place the caladium tubers in a cardboard box, and pack them in dry perlite, vermiculite or peat moss. Pack the tubers so that they aren’t touching each other. Store the caladium tubers in a cool, dry place where the tubers are out of sunlight. Keep temperatures above 50 degrees. To prevent mold or rotting of the stored caladium tubers, you can dust them with an all-purpose fungicide, such as orthocide, when you pack them. You can replant the caladium tubers outdoors in spring, after all danger of frost has passed and the soil temperature is around 70 degrees. Plant the caladiums in dappled to moderate shade, where the soil is moist but well-draining. Beware that stored caladium tubers don't usually produce the same foliage quality the second year. 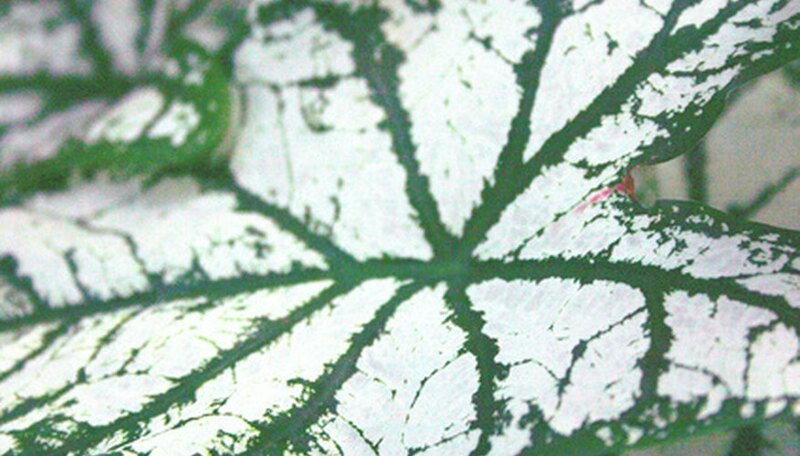 White-leaved caladiums tend to keep their foliage color year to year better than other types of caladiums.